Imagine you packed your favorite perfume in your suitcase and went on that much-needed vacation. You’d probably watch how you handle your suitcase and pay special attention to avoid any bumps on the road while rolling it, right? Yeah, we thought so, too. Now imagine taking your pet with you, on a stroll through the park, on airplanes, on vacation. While pets certainly can’t break, they become stressed easily and having a good, sturdy pet carrier with wheels can be paramount to the comfort and safety of your furry friend. There are a lot of reasons why people invest in the best rolling pet carrier they can find. First of all, everyone wants what’s best for their pet. 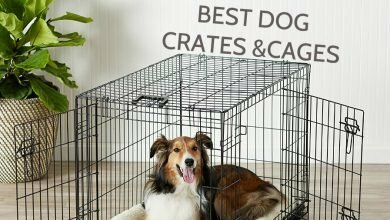 In order to do that, it’s really important to find a crate that your pet will enjoy spending time in. This means that it has to be the right size for the pet to move around in it, lie or sit in it. Secondly, the roller pet carrier you choose must be stable, durable, and able to glide over different surfaces without bouncing too much. And thirdly, it has to be practical for you to use it as well. After all, we’re talking about a product that can make your life easier, not harder. If you have a puppy (or another pet) that can’t walk long distances, or taking it on a walk in a roller dog carrier is just a matter of convenience, necessity or special circumstances (for instance, you’re traveling a lot by airplane and you want to take your dog with you wherever you go, or you have a senior dog that can’t move as much as it used to), then getting a rolling dog carrier might be the thing you never knew you needed! In this article, we’ll go over 10 high-quality rolling dog carriers, their features, pros, and cons, and we’ll find the best rolling dog carrier on the market. 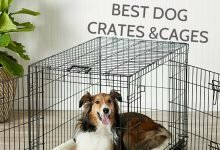 Additionally, we’ll provide you with an elaborate, yet concise buying guide and other useful information on dog crates on wheels (they can be used for cats, as well, but our primary focus will be on the dogs). Read on to find out everything you ever wanted to know about rolling dog crates but never got the time to actually research the subject! 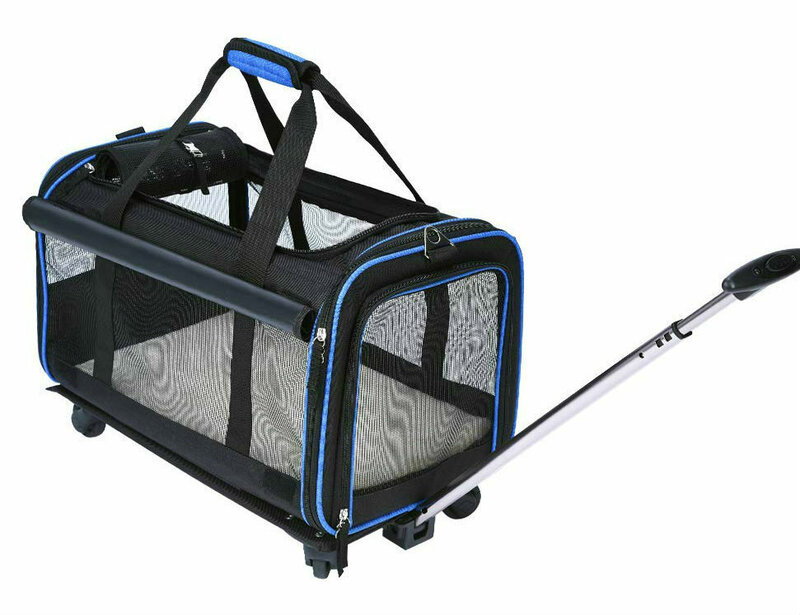 At 26 x 14 x 14 inches and weighing around 9 pounds, the Petsfit rolling pet carrier is sturdy and reliable. It’s able to carry pets that weigh as much as 28lbs, no doubt because of its high-quality materials that provide stability and minimize bounciness on the road. However, keep in mind weight isn’t the only parameter that you should use when deciding on your pet carrier; length and height also play a crucial role. It’s perfect for when you need to take your dog to the vet or when you plan on going for long walks because a lot of smaller breeds can’t walk many miles before getting tired. The carrier is easy to take off the wheelbase and use as a regular carrier, which can come really useful, especially at the vets. However, don’t count on carrying your dog around in it for long – without the wheelbase, the bottom of this carrier becomes more bendable, which isn’t ideal if your pet is on the heavier side. 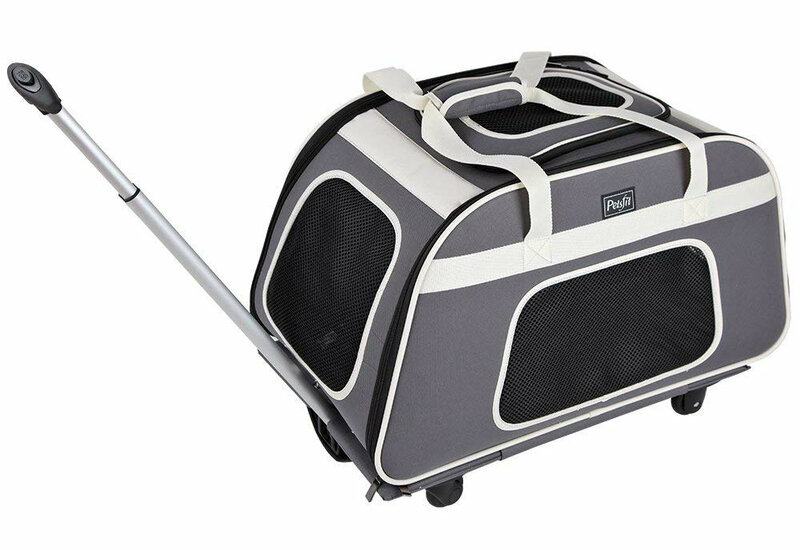 This sturdy pet carrier with wheels and handle comes with 34.5″ handle, two zippered top, and front openings, making it easy to get a hold of your pet when taking it out. 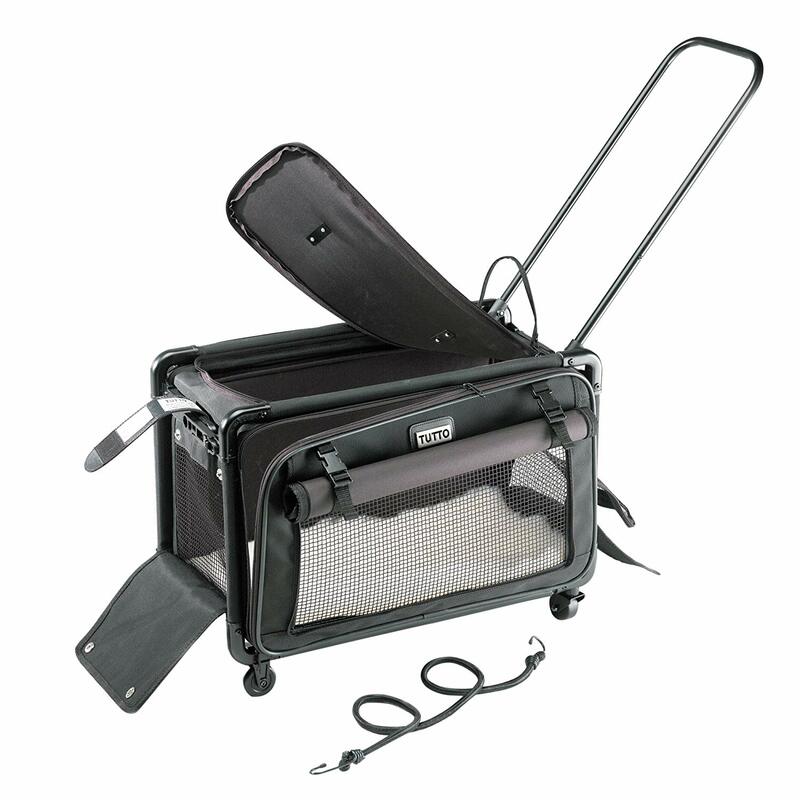 There are 4 mesh openings, one on top and three on the sides, that guarantee that the ventilation will not be an issue, no matter how long your dog spends inside this wheeled carrier. On the back of the side that doesn’t feature a mesh opening is a small pocket, perfect for storing essentials like some dog food and a leash. The mesh opening feature double zippers that can be clipped together, if your dog likes to poke through and run away, although the openings feature only single-zipper closing. Another practical thing about it is that it’s large enough that it can serve as your favorite sleeping spot in the house when you’re not using it outside. Plus, it’s collapsible and can be stored away flat, if you prefer not to use it as a pet bed around the house! While this is one of the best rolling dog carriers on the market, precisely because it’s durable, firm and sturdy, that prevents it from being airplane-friendly. There are some airlines that can fit this carrier beneath the seat, but most do not have that kind of space. However, most airlines allow owners of small dogs to carry them in their lap during flight, which gives you the option of folding the carrier and putting it below the seat after you board the plane. Our runner-up is a more discreet version of the Petsfit carrier and comes in second place simply because its weight capacity is 25lbs, compared to the Petsfit’s 28. Its dimensions are 22 x 11 x 15 inches, which is also smaller than the previous carrier. While 25lbs is its official weight capacity, some customers have pointed out that in reality, this carrier is more suitable for dogs that weigh from 10-20 pounds at most. It’s made out of strong, fiberglass material that guarantees this carrier will last you for a long time. 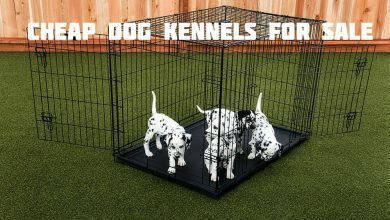 However, one customer reported that even though the fiberglass is firm, it isn’t indestructible, which means that your dog could potentially bite through it, as it could with any other mesh openings. 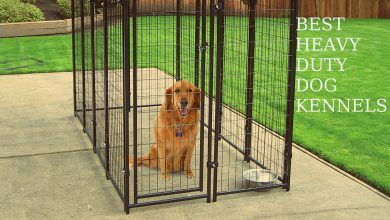 Because it’s so sturdy and lightweight compared to some other carriers on the market, this would be an ideal dog kennel with wheels for senior citizens. Similarly to the Petsfit, this one can also be folded flat and stored away, so it doesn’t clutter your living space. When speaking of practicality, the Tutto large dog carrier with wheels really shines! It features 3 zipped entrances, a roll-down privacy flap, and also has a lot of storage space, including a grooming tool organizer. Not only that, but it has washable internal padding, so cleaning it is a piece of cake. As for the ventilation, there’s more than enough of it, as long as you don’t keep the privacy flap down all the time. The three mesh openings allow your dog to feel a light breeze when rolling on wheels. Speaking of which, you’ll be delighted to know that it rolls easily and without much vibration, which is crucial for not stressing out your dog, especially if the privacy flap is down and it doesn’t see its surroundings. At 11.5 x 18.5 x 19 inches and 6.2 pounds, this pet carrier with wheels is also sturdy (although not as much as our winner and runner-up) and suitable for pets up to 20lbs, although some customers have said that 15lbs is a more realistic weight capacity. It features top and front access doors, two mesh side windows for airflow, and an interior safety tether, so as to make your dog’s ride as enjoyable as possible while making sure your pet won’t escape even if it does manage to open the zipper closing. However, if you really want to be on the safe side, the good news is that both openings feature double zippers, so you can clip them together for added security. What makes this carrier stand out is the fact it has a car seatbelt strap so that you can secure it when driving. It can also double as a backpack – there are two hideaway straps you can pull out and carry your pet over some really bumpy terrain if needed. This rolling backpack pet carrier has two storage pockets and a two-position handle, so you can adjust it according to your height. The 2 fastener clips at the bottom of the carrier are there to secure it to the wheelbase while standing upright, along with a Velcro fold over the flap. In order for the carrier to slide under the airplane seat, the Velcro flap and two bottom clips need to be undone. If you have a small dog that doesn’t mind not being able to lie down while rolling, this is an amazing choice – it’s airplane-friendly, it can be used as a backpack and it has enough storage space, especially for the needs of a smaller breed. However, do keep in mind that the zipper quality is not top-notch, so be sure to carefully store it when you’re not using it, to avoid any additional damage to the zippers. If you’re looking for a lightweight, simplistic dog travel bag with wheels, look no further than the Snoozer pet carrier. Its dimensions are 12.2 x 15.5 x 23 inches, and it weighs around 7 pounds. It’s easily foldable so that you can store it away easily or carry it around with you without much fuss. The maximum weight capacity of this carrier is 30 pounds, and some customers said that they even carried their 40lbs pets in it, which is definitely a medium-sized dog category. This dog carrier with wheels is actually a 4-in-1 product: it can be used as a backpack, car seat, wheel carrier and dog bed for when you’re at home. Its shape allows your dog to sit in it while rolling (although if you have a really small breed they might have the option to lie when rolling as well), but when flipped horizontally, your dog will be able to lie down easily. While it’s excellent for most airlines, its size isn’t compatible with every airline, so our advice is to check your airline restrictions before getting this carrier. It’s made out of durable microfiber that can be wiped clean with a wet wipe – cleaning really doesn’t get much simpler than that! There are also multiple storage pockets and an inner leash clip, which is necessary because all sides except the back side of the carrier are made out of mesh material with zips, which wouldn’t be so hard for your pup to open from the inside and run away. If your dog doesn’t like enclosed crates, this breathable, large rolling pet carrier is truly a great option. However, there are a few downsides to this carrier, preventing it from being in our top 3 choices. First of all, the backpack straps aren’t nearly as durable and well-made as the carrier itself, which excludes the possibility of actually carrying your dog comfortably, especially if it’s close to the mentioned 30lbs. Also, several users have commented that the carrier runs smaller than stated on the package and that their 20-lbs dogs were pretty tight in this carrier. However, this might be due to the fact that lightweight dogs don’t have to be small – they can just be really thin while being long and high, so be sure to double-check the dimensions and weight capacity you’re after. Similarly to the Snoozer carrier, the ibiyaya multi-function carrier can be used as a wheeled carrier, a backpack, car seat and a shoulder carrier. It comes in 4 vibrant colors and 1 neutral one, allowing you to possibly match the carrier color with your jacket or sneakers. The recommended weight capacity of this dog carrier with wheels is 18 pounds. The assembly of the carrier is quite easy and the instruction manual that comes with it is comprehensive. The sides are made of high-quality EVA foam which is free of toxic chemicals and firm enough so that it won’t go out of shape. There is a large opening at the top-front, which is ideal if your dog enjoys peeping its head outside and enjoying the ride. However, if your dog is easily scared, there is a privacy roll-up flap that can help with that. Both lateral sides feature mesh openings, which provide sufficient airflow to ensure your dog doesn’t get overheated. There’s also an inner tether in the carrier. The inner padding is removable and machine washable, and you can also opt to vacuum the carrier or clean it with a damp cloth. An interesting detail about this carrier is that it has a ‘locking zippers’ system, designed to prevent your dog from escaping. However, these zippers are also a bit problematic. They tend to stick and are fragile, so they require a gentle touch and a bit of patience if you don’t want to break them. One user remarked that the zippers do not stay together; that’s something that can be dampened by the presence of the tether, but still isn’t that practical. Because the ibiyaya dog rolling backpack uses a single strap for both shoulders, it can prove a bit of a challenge to get your second arm through the strap once your pet is inside. The measures of the Sherpa carrier are 20”x12.25”x 10.5” and the carrier is suitable for pets up to 22 pounds that are 19” in length x 9.5” in height. 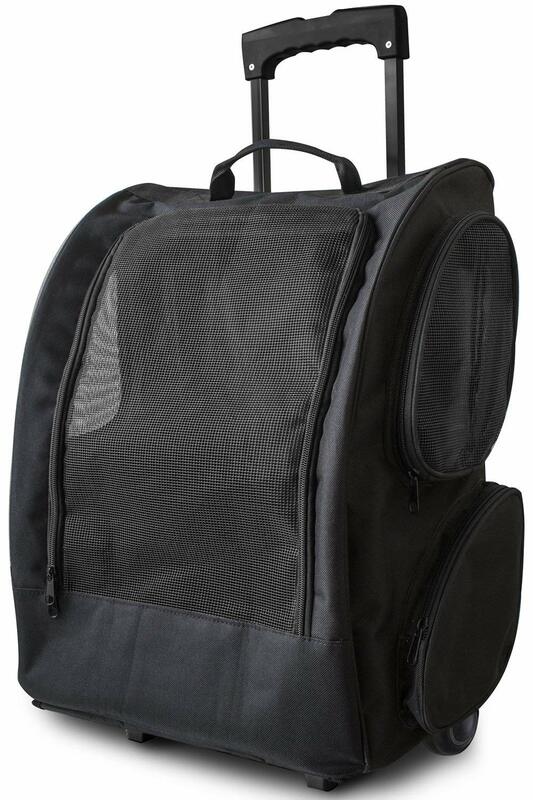 It’s made out of durable nylon and features an adjustable shoulder strap that converts to a padded pull handle, 4 mesh panels for ventilation, roll down privacy flaps, and a top and side entry with locking zippers. The bottom of the carrier is covered with faux sheepskin, which most dogs will really enjoy. Additionally, this carrier features recessed castor wheels for easy-glide, steady motion which minimizes vibration. The most unique part about the Sherpa carrier is the ‘Pet on Board’ flag, which is not only cute but increases the visibility and safety of the carrier. 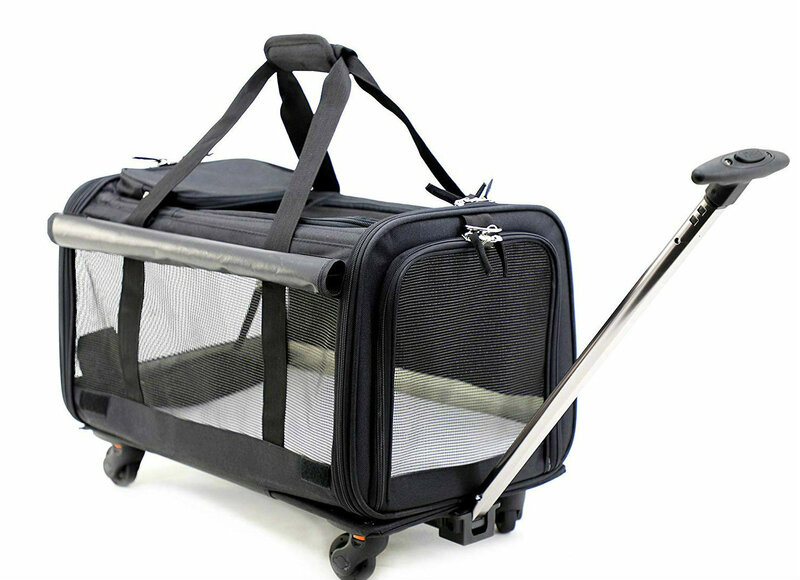 Sherpa has a Guaranteed-On-Board Program, making this a stress-free, great airline approved pet carrier with wheels. The spring-wire frame allows the carrier to be stored under the airline seat without losing its shape. However, one of the downsides of this carrier if that there’s no headroom for your pet to sit or stand in it, besides the option of completely opening the top, which is far from ideal. Like most other, this 16″x12″x15″ roller dog bag is multifunctional and can be used as a carrier, car seat, backpack, roller bag, and a tote. Inside, there is a tether that can be attached to your pet’s collar or harness, and the telescopic handle can be stored away as if it were a suitcase. The Pet Gear’s sides can be unzipped and expanded so as to provide 3 inches of additional space, and there are 2 velcro pockets on the sides as well. The ventilation is satisfactory, as there are a lot of firm, high-quality mesh panels on the side of the carrier. The security screen on top can be rolled up and secured with Velcro tabs that are attached to it. The bottom pad is removable and washable. That being said, it’s also pretty hard and won’t offer that much comfort to your dog. One way to solve this would be putting a thick towel at the bottom of the carrier; however, that will make the inner measures smaller than usual, so this won’t work if you have a taller dog. Regarding the size, this carrier is only suitable for small dogs. Also, some customers have complained that the straps don’t fit the shoulder area and are very uncomfortable, meaning that hiking with your dog is eliminated. Still, if you need just a good roller bag, you might want to consider this one. The unofficial breathability champion, the YOUTINK airline approved dog crate with wheels can be used as a car seat, a travel backpack, a rolling carrier, and a comfortable bed. 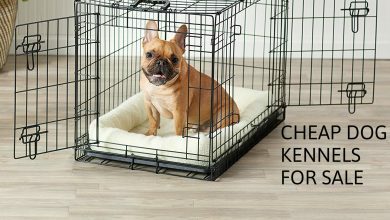 Mesh panels are on all 4 sides of the carrier, and they are scratch-resistant, so they will withstand even your small dog’s hissy fits. There are 2 roll-up flaps on the wider sides so that you can easily make this crate a bit more private. The carrier is suitable for pets under 25lbs and measures 20″x12″x13″ and features 2 entrances, one on the top and one on the side, which make it easy to put your pet in and take it out of the carrier. Inside of the carrier you’ll find a washable soft fleece mat that will offer your dog some comfort, although you can always increase it by putting an extra towel on the bottom. The zippers on this carrier are sturdy and the company states that they have a usage life of 10.000 uses. However, a few customers would disagree with this statement, as they have noted that the zippers became increasingly difficult to use after a couple of uses, and the non-slip shoulder strap isn’t the highest quality either, because a couple of users have reported it snapped. That being said, most users have a great experience with the YOUTHINK carrier, and so do their furry friends. 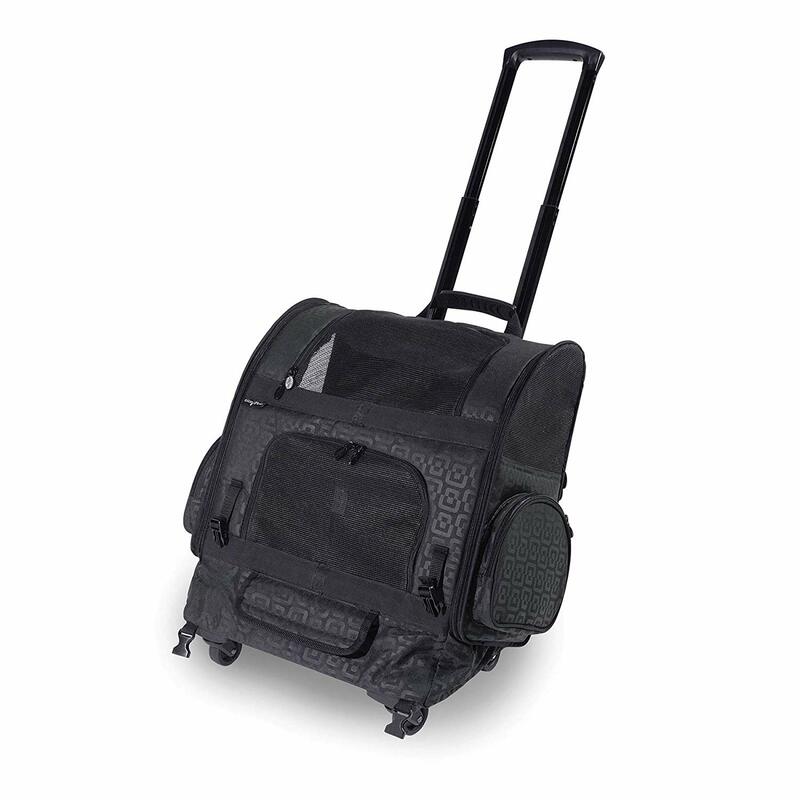 For those who don’t have or don’t want to spend close to $100 on a pet carrier, the OxGord airline pet carrier with wheels is truly a godsend. It’s made out of 600D Polyester, measures 14″x11″x19″, weighs 5 pounds and costs up to 4 or 5 times less than an average wheeled carrier. It features side mesh panels, side zipped pockets where you can store dog treats, a leash, toys and some of your stuff as well, front door zipped opening, a telescopic handle, and dual wheels. This carrier doubles as a backpack, although users have said they’d like to see the shoulder straps be improved with more padding. While this carrier has all the bare necessities of its pricier contenders, the materials used to construct it are on the cheaper side. Now, that’s not to say that they’re 5 times cheaper – this is still a good investment, especially if you’re short on cash. However, don’t expect this carrier to be durable and last you for years. Chances are, you’re going to need to get a better one if you tend to travel a lot and take your dog with you. The okdeals dog bag with wheels is great for medium-sized dogs that weigh up to 22lbs. It measures 20.07″x12.20″x11.94” and features a detachable 4-wheel platform, a lot of mesh panels, roll-up flaps on the sides, inner safety clip, as well as a retractable metal handle for easy rolling. It’s very similar to the Sherpa carrier, although the overall quality of the zippers isn’t the best. That being said, there are some perks to this carrier, one of which is that the handle stays up when you let it go, which seems irrelevant now, but it will make your life easier if you’re traveling with a bag, suitcase, and a dog carrier on top of it, trust us. The overall quality of this carrier is good and it rolls smoothly on various surfaces, making it an okdeal (pun intended). Every dog owner gets how hard it is sometimes to get to the vet, the groomer’s, how complicated and stressful travel with pets can be and how imaginative dogs are when they don’t want to go to the place you’re taking them (hello, all the poor people whose dogs refuse to walk to the vet’s and choose to just lie on the ground). That’s why getting a quality dog carrier you can roll on the ground can solve a lot of your problems at once! Not only are they supremely practical for getting your dog to places it doesn’t want to go without a fuss, but it’s also useful to have on hand if your small dog or a puppy becomes tired during a long walk. Almost all dog carriers with wheels are multifunctional. They can double as a carrier, but as a dog bed as well. This is especially true if you only use it outside when you take your dog to the vet’s once every couple of months. Why buy a dog bed, when you can train your dog to sleep in its carrier? This might be an issue for bigger dogs, although with a little effort you could find a pretty good pet carrier on wheels for large dogs on the market. As a general rule, dog wheel carriers tend to be made for small to medium-sized dogs, because the overall cost of construction is lower with a carrier that doesn’t have to carry a heavy dog around, and because it would be difficult to lift that crate and put it in the car, or board an airplane with it. For those of you who are proud owners of over 50lbs dogs, finding a good extra large pet carrier on wheels might be a daunting task. If you need a wheeled carrier because you have a large, elderly dog that can’t take long walks anymore, consider getting a dog stroller. However, if you need to travel with your large dog, getting a dog travel crate might be your only option. Rolling dog carriers may significantly differ in design, but they all have the same basic components, and those are: the carrier itself, which is usually made out of sturdy and durable materials, the mesh panels, which are of crucial importance for ventilation and airflow, the wheels, that can be integrated into the carrier, or can be detached from it, and the handle, which can be made out of metal or fabric, depending on whether it’s firm and retractable or a shoulder/hand strap. When choosing a rolling dog carrier, there are certain things to pay attention to. Start with your dog’s character. Does your furry friend like to scratch or bite things, is it easily scared or nervous in large crowds and unknown places? If this is the case, our recommendation is to invest in a carrier that has really sturdy mesh panels. They are often the thinnest part of the carrier, and a nervous or scared dog could try to bite through them. However, if you have a calm puppy that just wants to chill, you don’t have to worry about the mesh panel’s sturdiness. Secondly, think about whether your dog likes to look around when traveling. What does its behavior in the car look like? Does the pup look through the window and enjoys the air, or lays down in the back seat? If your dog falls into the first category, make sure to buy a carrier with a top opening so that it can sit and look around as you go. Now, let’s take an in-depth look at different rolling carriers options and buying the guide. We all want what’s best for our dogs. So, in order to get the best rolling pet carrier, you need to consider the individual needs of your dog first, and then adapt them to your own needs and the reasons you’re buying a rolling carrier in the first place. Once you know your exact requirements, it’s time to start choosing. Below, we’ve gathered 6 main aspects of rolling dog carrier to consider. One of the most common mistakes dog owners make is getting a carrier that’s suitable for their pup’s current size. The most practical thing to do is to get a carrier that’s sized according to the maximum size and potential weight gain of your dog’s breed when they’re fully grown. Sure, that may look a bit funny until your dog grows into their new rolling carrier, but it sure beats buying multiple carriers as your puppy’s growing. There are small, medium and large rolling dog carriers. The small ones are made to carry dogs that weigh up to 15lbs, medium sized ones have a weight capacity of around 25-30lbs and large ones are made for 30-40lbs dogs. You should know that most rolling dog carriers are made for dogs that weight up to 40lbs. 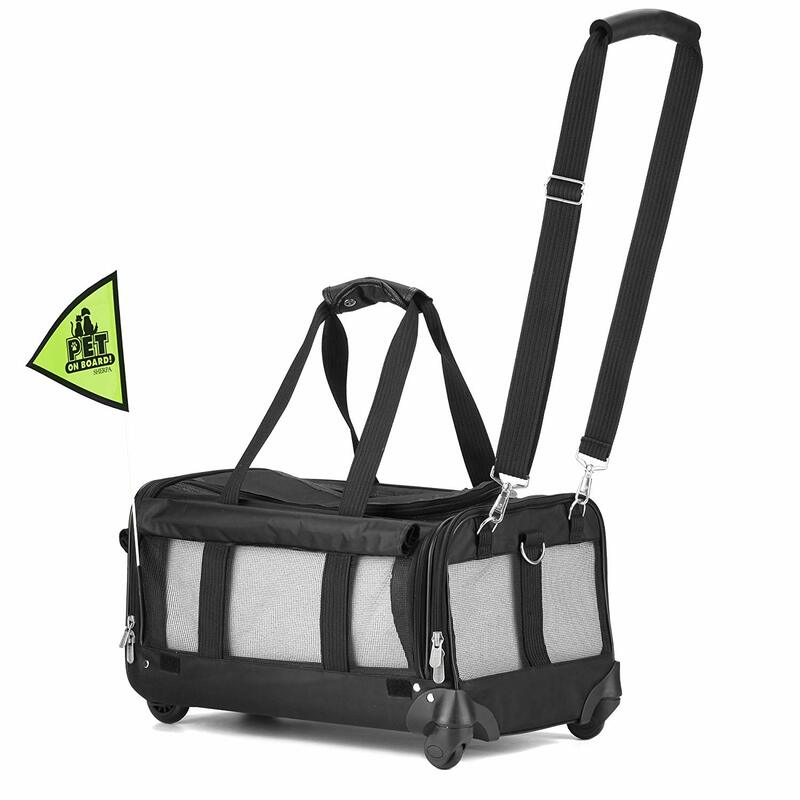 A large rolling dog carrier doesn’t translate to a carrier that accommodates large dogs. If you have a large dog breed, you’re probably going to have to get a pet stroller. The next thing you have to take into account is the total weight capacity of every rolling carrier. Don’t buy the one that just fits your dog to a T, because most of the carriers have some extra storage space, and you’re going to fill it with treats, toys and a leash – they all have some weight. It might not be much, but try to take into account the total weight of your dog and the things you’ll carry along in the carrier, before deciding on the size. If you don’t know how to measure your dog, here’s a quick rundown: you should measure their length and height. Length is measured from the front of the chest to the base of the tail. Height is usually measured from the floor to the top of the shoulder/back. Also, make sure our dog has 2-4 inches of free space in width, height and length inside the carrier, so they can sit, lie down and turn around comfortably. Every dog has their own character. Some are completely chill and couldn’t care more about the crowd and the noise, some are curious and like to look around wherever they go, and some are timid and scared easily. 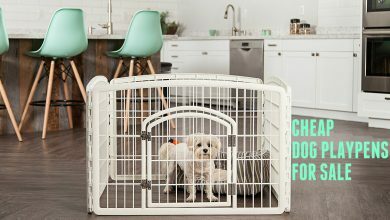 If your dog falls into the two latter categories, they might want to escape the rolling carrier, either to snoop around and explore the environment, or because they’re scared. If that is the case, it’s important to get a carrier that has an inner leash or harness clip, or that closes with a double zipper so that the two zippers can be clipped together to prevent the dog from opening the carrier entrance. Also, if your dog likes to see where they’re going at all times, consider getting a carrier with a top opening which will allow them to look around when traveling. If your dog is shy and scared of places and people they don’t know, make sure to get a carrier that has a privacy roll-up that can be put over the mesh panels, to protect your dog from the environment and give them a sense of privacy and security. An average price for a rolling pet carrier is around $60-80. For that amount of money, you’ll get a good-quality carrier that might have some minor issues which you could solve on your own. If you’re not keen on giving a lot of money on a carrier (for instance, if you only need one to use a couple of times a year when you take your dog to the vet’s), you can find some sensible options for as low as $20-30. And if you feel like splashing some cash for your favorite furry friend, but also get a high-quality product as well, then you’re looking at a $90-140 investment. That is a substantial amount of money to give, but if you know you’re going to use it on the regular, it’s best to purchase something that’s the most durable, sturdiest and reliable. The heavier your dog is, the more durable the carrier material has to be. However, there are a lot of really good, sturdy options around, that is more than enough to withstand your dog’s weight without a problem. Where material counts the most, though, is with the mesh panels. Mesh panels are necessary in order to provide adequate ventilation and airflow, especially if you’re planning on taking your pet on longer strolls. Because they might get scared, some dogs will try to bite or scratch through the mesh panels. If that sounds like something your pup would do, be sure to check the mesh panels’ material and sturdiness beforehand. As we’ve mentioned, most rolling carriers can double as a dog bed when flipped horizontally. Aside from that basic multifunctionality, there are some rolling carriers that can be detached from the wheeled platform and transformed into regular tote carriers and/or over the shoulder dog bags. 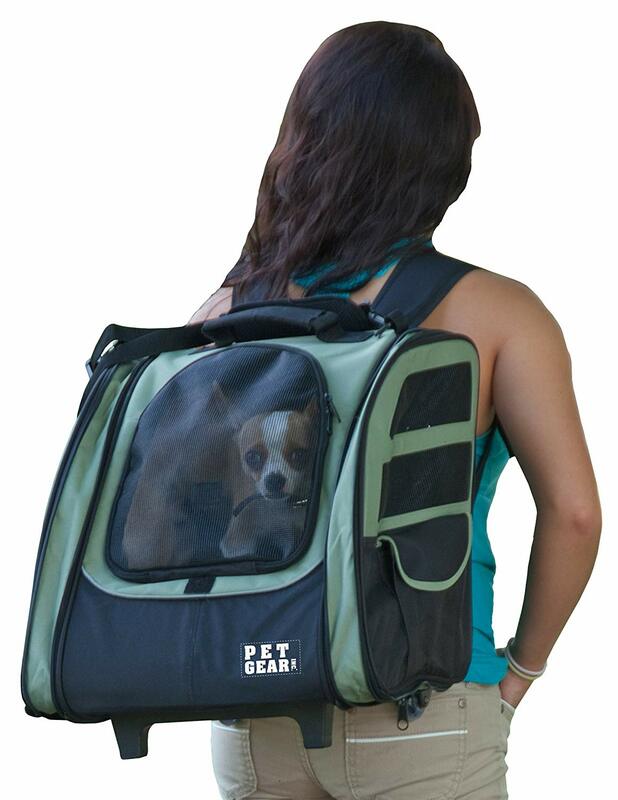 For those who like to go hiking, the best option would be to purchase a backpack rolling dog carrier. 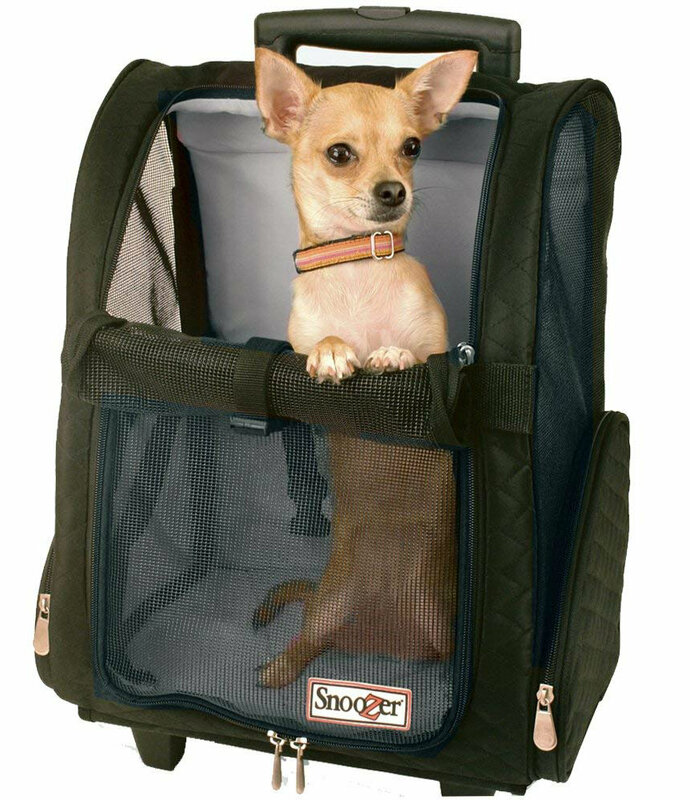 If you travel a lot and would like to take your dog with you, consider getting a dog airline carrier with wheels. They’re the same as any other rolling carrier, except their sizing is adapted to most airline baggage guidelines. If you have a specific airline you fly with often, be sure to check their specific guidelines before getting a dog carrier, even if it says that it’s airline approved. Almost all dog rolling carriers have extra storage space, whether it’s just a small pocket on the back or a few zip pockets on the sides. Consider your needs and habits and take them into account when getting a carrier for your dog. Don’t think only about the dog’s toys and leash, but think about whether you need a pocket for your keys, wallet, and other personal stuff to keep separate from the treats. If you’re an airplane traveler, there are some rolling dog carriers that have a flag attached to them, that warns the staff and other passengers that a dog is on the plane. 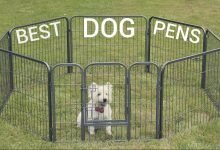 This is a useful perk that will definitely help your dog cope with the crowd, especially on their first flight. Expert tip: On the day of a long trip in the rolling carrier, take your dog on a long walk beforehand. This will make them calmer and increase the chances of them getting to sleep in the carrier. When traveling on the plane, make sure to take away the water bowl two hours before going to the airport and don’t give your dog food in the morning. This will keep the mess they (maybe) make inside the carrier to a minimum. And if an accident does happen, make sure to place some pet training pads inside the carrier, both on the bottom and on the sides. Dogs are used to running and walking on their own. It might be a big shock to them if they’re suddenly rolled around in a carrier. That’s why it’s crucial to present the carrier to them as something fun, as a safe place for them that they’ll want to hang out in. In order to achieve this, get the carrier a week before the planned stroll/hiking/trip and make sure to give your dog treats inside of it, so they grow to like it. When they get accustomed to the carrier, try taking them on a ride through your living room a couple of times before taking them on a longer ride. 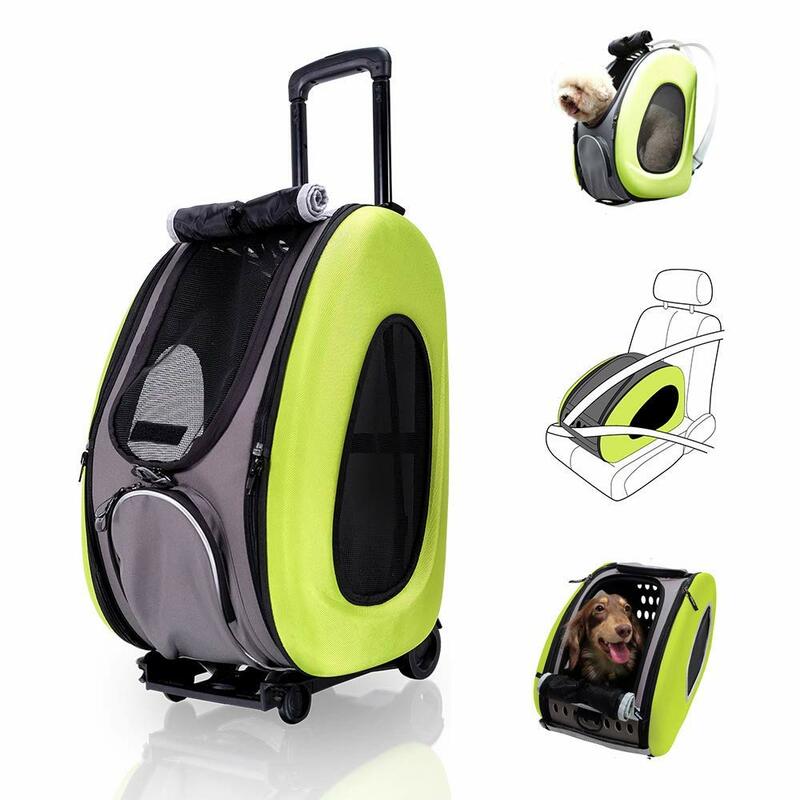 If you introduce the rolling dog carrier this way, your dog going to have a blast whenever you two go somewhere in it. A dog is a man’s best friend and companion, and by getting a rolling dog carrier, you’ll make it possible for them to accompany you on your vacation, camping trips, hiking and much more. Ultimately, they are a way for you and your dog to get closer while being practical at the same time. We hope we gave some good advice on how to choose the best rolling dog carrier for your needs and that you’ll enjoy your new purchase immensely!